A worker at Leveroni Ranch in Sonoma, Calif. rushes to pick grapes ahead of a heavy winter storm. Grapes can't grow without water. But now, near the end of harvest season, Tuesday's storm spells trouble for Chardonnay sippers. The tail end of a typhoon washing over Wine Country spurred a last-ditch effort to pull grapes down from the vines in Napa and Sonoma. 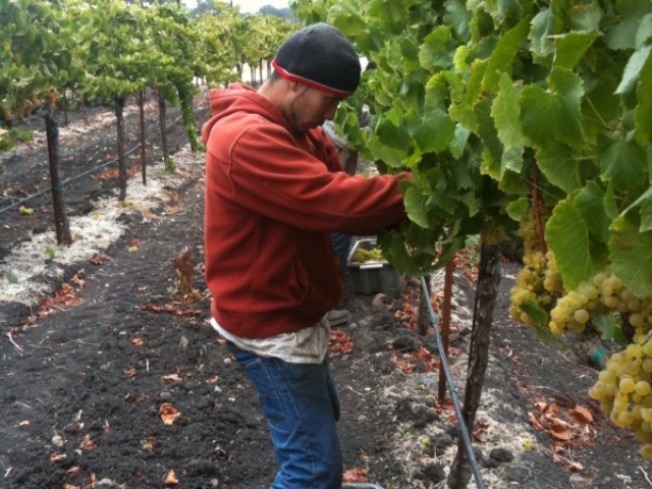 With several inches of rain forecast, grape growers are desperate to save their crops. "Everyone I've spoken to and certainly the wineries, we're all worried right now," said Ned Hill, a Sonoma County grower and vineyard manager. "We're in scramble mode. We've been in scramble mode since the storm got on the radar last Wednesday or Thursday." Thin-skinned Chardonnay and Zinfandel grapes, which grow in tight clusters, are most at risk, while Cabernet and Merlot varietals are more resistant. So growers are picking white-wine grapes, and leaving the reds on the vine as they hope for the best. The harvest season normally begins in August and ends in October, but about 25 percent of the crop is still hanging. Hill said that grapes that stay wet for more than 24 hours could rot. He set up lights in his vineyards so workers could pick through the night. His workers managed to pull all the Chardonnay grapes from the vineyards he owns and manages, but others have not. Joe Leveroni of Leveroni Ranch said he'll suffer losses but declined to say how much he'll lose. He says getting this much rain in October is "extraordinary." Up until now, the crop looked "stellar," he said, and it will be tough to leave high-quality grapes on the vine to rot. Workers pulled long shifts, trucks ran all night, but there's only so much crews can do.